My experience with horses has been very different from Ricks. 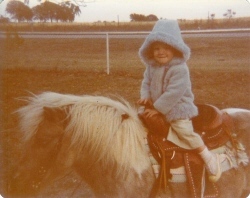 Growing up on a Dairy farm in central Oklahoma, horses weren’t a big part of our lives, but we always had horses (backyard ponies, and kid horses) around for as long as I can remember. 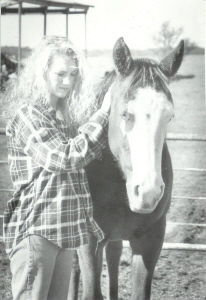 It wasn’t a lifelong dream of mine to be a horse trainer, but like most little girls, I was drawn to horses. And the older I got, the more I desired to be around them and learn more. For my 12th birthday, I was surprised with two older mares (Grey and Brownie). For the next six years, these poor horses took me through round-up club play days, parades barrel racing, trail rides... I was very comfortable with my two horses – but, that was it. 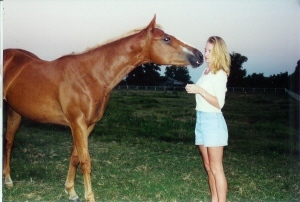 After high school, I decided to get serious about barrel racing, so I bought a two-year-old paint mare (Sadie) that had 30 days training. I thought I was going to train her myself – Ha! This is where my real journey began. I thought things started out great, but Sadie, in no uncertain terms, let me know that things were not okay. 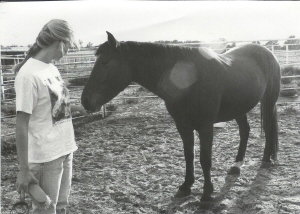 I didn’t like getting bucked off, or being embarrassed at every trail ride with the worse behaved horse, so it didn’t take me long to realize that I didn’t have a clue when it came to horses. (Although Sadie could have told you that right away) I just couldn’t understand it; I thought I knew horses and how to ride. I became very frustrated and searched out help. I bought every training video and book and magazine that I came across. I would take advice and help from anyone and everyone who offered to help. By the time I was finished, we were both so confused and frustrated that we couldn’t see straight. I begin to worry that I was going to mess her up for good, so I adopted a couple of mustangs and decided to “practice training” on them. – This turned out to be not the greatest idea either. Through it all, we came out alright, considering the train wreck that it could have been. The thing that I learned the most in all of this is that I wasn’t alone. A lot of people, like me, love horses and want to do right by them, but just don’t understand how to communicate with feel.